Frontispiece from Athanasius Kircher's Ars Magna Lucis Et Umbrae. To the left is a woman as the personification of the sun, with the symbols of the zodiac covering her body. To the right is a woman as a personification of the moon covered in stars. Below her sits two peacocks. 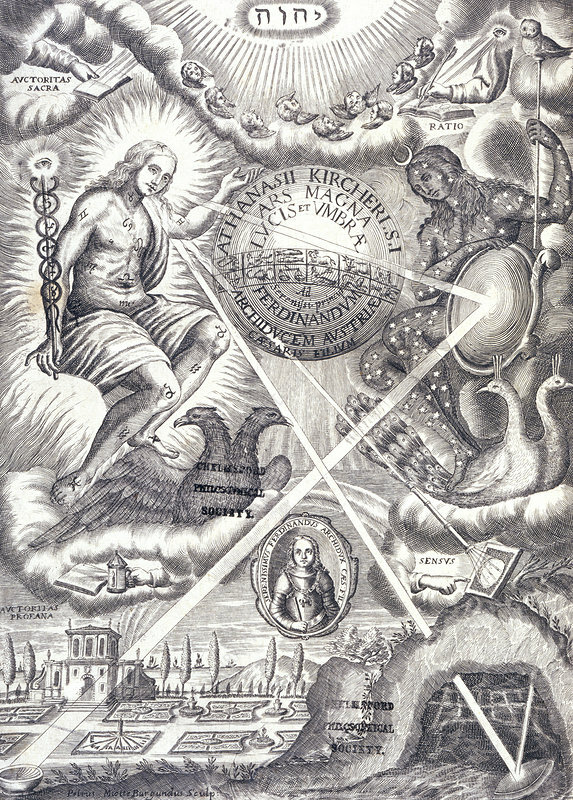 Rays of light hit various lenses which reflects Kircher's discoveries. Kircher demonstrated that by placing a lens between a screen and a mirror which had been written on, a sharp but inverted image of the text would appear on the screen. By using a spherical water-filled flask as a condenser to concentrate the light, Kircher found that texts painted on the mirror's surface could be projected by light from a candle after dark. These demonstrations eventually resulted in the birth of the magic lantern. Ars Magna Lucis Et Umbrae was published in 1646.